With floor space at a premium in todays homes, wallbeds are a great idea adding elegance and usefulness to almost any room. Beds that fold down from the wall save space, and can be a rooms focal point when closed. When you move to another home, you can take the unit with you, or leave it in place to increase your homes resale value. Utilizing a state-of-the-art piston lift mechanism and custom made cabinetry from The Colonial Cabinet Shop, a client can have a great bed for nightly use or as a guest bed that really makes a statement. The front panel can be made to look like an armoire, a bookcase, or even a fireplace. A fold-down desk surface can add even more value for a wallbed in a home office. The beds can be had in queen, full, or twin sizes, and take any standard mattress up to 12" thick. The cabinets can be made for a vertical mount (standard), or side mount (good for low ceilings or narrow rooms). Optional side cabinets are just one of many additions that can be chosen by the client to enhance their wallbed. Since all projects are custom-made, these are just a few of the options that could be incorporated into a wallbeds side cabinets. The Colonial Cabinet Shop designs, builds, and installs wallbeds in the Atlanta Metro Area. For those who live outside the Atlanta Metro Area, wallbeds can now be picked up from the shop and self-installed. This option saves you the delivery and installation fees. A very detailed instruction manual, as well as a tutorial at pick up time equips you to tackle the project with ease. All wallbeds from The Colonial Cabinet Shop are made from the highest quality cabinet grade plywood and solid lumber--no particleboard, "melamine", or MDF at this cabinet shop! 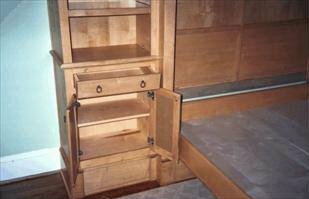 Time-tested traditional joinery is used to further strengthen the bed and side cabinets. All stains and finishes are hand-applied over several days.